Last Wednesday, December 10th, was the International Human Rights Day, and no day was more fitting for submitting a petition to the High Court of Justice. Alongside the council chiefs of the West Bank villages Jalud, Al Mughayer and Turmusaya, Yesh Din demanded on Tuesday the removal of the illegal outpost Adei Ad, which was the focus of our 2013 report, The Road to Dispossession. Generally when we demand the removal of an outpost, we rely on planning and zoning laws. Those very laws are indeed relevant in the case of Adei Ad: every structure in the outpost was illegally constructed, and there is a demolition order against each of them – orders that the Commanding General, Central Command and the Civil Administration choose time and again not to enforce. But in the case of Adei Ad, our claim goes even deeper: the problem with the outpost is not merely the fact that it violates planning laws, but rather that the very existence of the outpost necessarily leads to human rights violations against the residents of the neighbouring villages. The outpost of Adei Ad sits on land belonging to the villages of Jalud, Al Mughayer, Qaryut and Turmusaya. Twenty-six percent of the constructed area of the outpost sits atop private Palestinian land, while the rest was built on “public land” allotted by the Settlement Division of the World Zionist Organization (Hebrew). The Palestinian agricultural land around the outpost is classified as private and unregistered.. As a direct result of the building of the outpost, residents of the four villages have systematically lost access to their land and found themselves victims of violence by Israeli civilians. Between 1998 and 2012 we managed to document 96 criminal incidents around the outpost. It is important to note that these are not all the criminal incidents that took place near the outpost, but merely those we managed to document (the actual number must be assumed to be significantly higher). Most of the incidents consisted of theft or vandalism, although 22 percent included physical assault or threats by use of a weapon. The Samaria and Judea Police Department (SJPD), as usual, proved incompetent: of the 56 cases in Yesh Din documented a complaint filed with the police, 46 – 80 percent – were closed due to the failure of the police investigation. We must further note that since April 2013, when our report was published, Yesh Din investigators documented 13 more incidents around Adei Ad, one of which included violence. The violence surrounding Adei Ad has a clear, ideological reason: to strike fear in the heart of the Palestinians and dispossess them of their land. Israeli civilians have taken over this land rapidly: in 1998 the size of the outpost was 15,554 square meters; in 2010 it ballooned into 465,331 square meters, growing some 30 times in size. At the time our report was published, 26 families lived in Adei Ad. Due to the presence of these 26 families, the situation of the villages whose land was taken over by Adei Ad has deteriorated greatly. The fear of working your land with the knowledge that you may be attacked by outlaws, that no one will protect you and that the area’s ruler will turn a blind eye, leads Palestinians to abandon their villages. While we do not have data on Al Mughayer and Turmusaya, we do know that 6,000 people have already left Qaryut, leaving only 2,800 residents. Of the 1,000 residents of Jalud, 400 have abandoned the village. The very presence of Adei Ad harms the right of the Palestinians to their property with the support of the authorities (these are mostly agrarian communities who make their livelihood off of the land). As soon as the outpost was built, the army hastened to declare areas around it as closed off to Palestinians. Sometimes these took the form of undocumented, oral orders (which cannot be appealed), while other times these were official orders. But when the rights of the Palestinians to the land collided with the lack of rights of the squatters, the army stood (and continues to stand) by the latter time and time again. This harms not just the right of the Palestinians to their land, located in Area C and under full Israeli military and civil control, but also their right to freedom of movement and right to work. And all this so that 26 families can lord over a territory of 465,321 square meters (not including a much larger region around the outpost, where Palestinians are routinely denied entry). The economic existence of four villages is endangered – leaving their residents defenseless in the face of ideological violence – in the name of 26 families of the chosen people, who are sentenced in one justice system while their neighbours are sentenced in another. And what is this very order whose disruption the authorities fear so much? The order is ‘Adei ‘Ad: the systematic overtaking of land while terrorizing the residents in order to drive them to despair over their inability to maintain their property, their rights, their honor. Our Minister of the Economy calls it “the tranquilizing plan,” whose stated goal is the annexation of Area C. Twenty years earlier Rechavam Zeevi called it “the quiet population transfer,” which sought to make the lives of the Palestinians so unbearable to the point that they simply leave. In Qaryut and Jalud, the system has already proven itself. 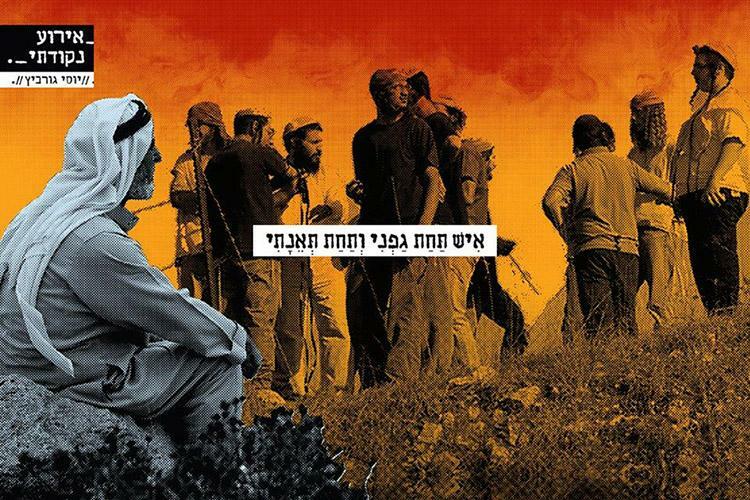 The removal of Adei Ad, a bleeding boil, will not end the occupation. There are, as previously mentioned, many outposts and settlements. It will, however, make a statement: it will say that a quiet, tenacious, non-violent struggle has a chance. It will state that in the end, people can reclaim their rights. It will declare that sometimes committing a crime carries a price. One can barely conceive of a greater gift in honor of International Human Rights Day. Here is a test for the court the calls itself the High Court of Justice. Will it pass? Break the law, and why not?